Humayun, as we have seen, did not live to enjoy rule. 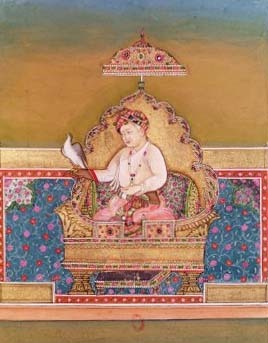 His son and successor, Akbar (1556-1605 A.D.) was the first in a line of emperors that for the next century would establish Mughal rule over practically the whole of India. This unprecedented empire building went hand in hand with the subcontinent’s most fertile period as far as art and architecture were concerned. Mughal architecture owes its origins to its religion, Islam, as a showpiece of prestige and power, for pleasure, and for death. These concepts are reflected in great mosques, forts, durbars and palaces, gardens and pools, and finally, tombs. 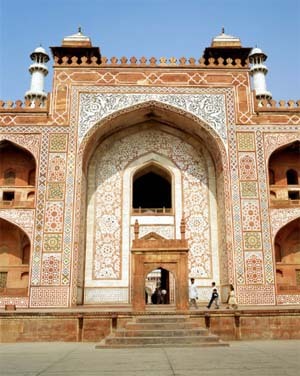 Formally and artistically, Mughal architecture owes as much to its genealogical origins among the Safavids and Timurids, as it does to the syncretism of its patrons, notably Akbar and Shah Jahan. It is thus that impeccable Charbagh plans combine with indigenous detailing as in the tombs of Humayun and Akbar, and the forts at Agra, Delhi and Lahore. Such is the volume of building during this epoch that it would be impossible to detail every building in this series. We will however attempt to make the task easier by classifying the architecture into building types and then discussing the major examples of each. Mughal building can thus be divided into fort, palace and garden, mosque and finally tomb. The function of a fort is to command large swathes of territory, to control the trade routes that pass therein, to inspire awe and loyalty amongst the populace, and finally to be a refuge if attacked. The whirlwind and extensive military campaigns of Akbar were contemporaneous with the construction of a large number of metropolitan and provincial forts, chief among which are the ones at Agra (from 1564), Ajmer (from 1570), Lahore (from 1580) and Allahabad (from 1583). Refinement and taste are the words that come immediately to mind even in so utilitarian a structure as these forts’ defensive walls. Fine detailing incorporates both Islamic and indigenous elements, primarily Gujarati in origin. 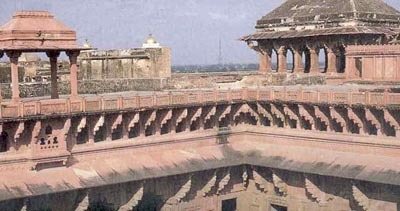 Agra fort, in the form of an irregular semicircle, has its back to the river Yamuna which thus protects its eastern side. 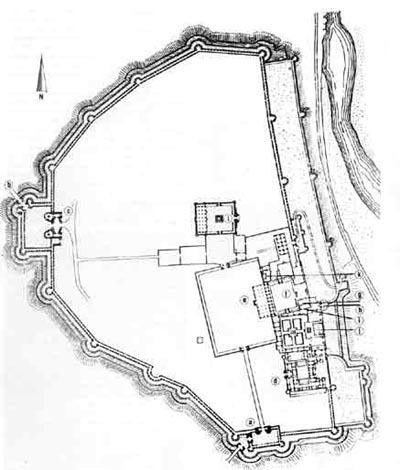 The riverside walls are punctuated nevertheless by defensive bastions of which the main one controls an access from the river and numerous underground passages. On the town side the bastions are regularly spaced and the height of the walls is 30m. The western wall is dominated by the massive main entrance – the so-called Delhi Gate- and the Hathi Pol. This gate is approached by a tortuous access ramp. 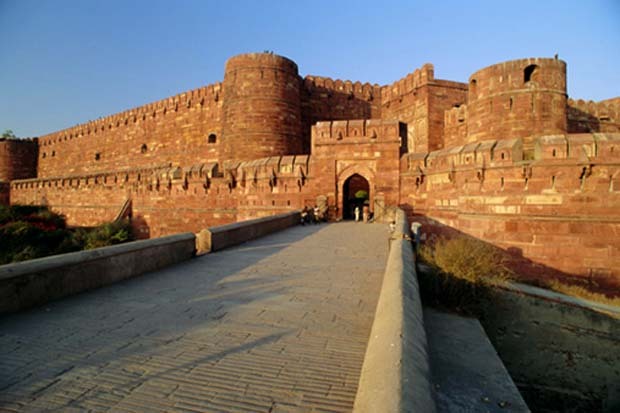 More to the south, the Amar Singh gate is defended by two towers which flank the entrance. A remarkable feature in this fort is a hybrid beast, part horse, part lion and part elephant sculpted on a panel. This monster evokes Assyrian men-beasts but also resembles the monsters of Hindu mythology. 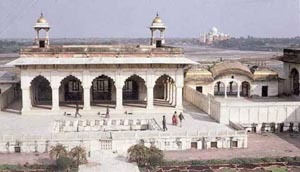 It is unfortunate that most of Akbar’s not inconsiderable work within the fort walls was demolished or modified by Shah Jahan’s rebuilding and transformation later. One specimen that does survive is the Jahangiri Mahal. This structure built for the emperor’s wives and family is similar in character to the Man Mandir at Gwalior. 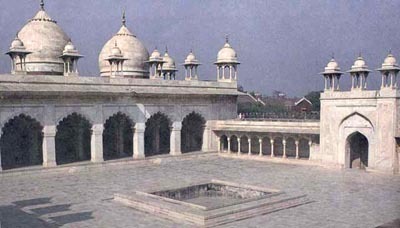 Of Shah Jahan’s additions, most notable are the Anguri Bagh (Garden of grapes) palace and the white marble Moti Masjid. The greatest surviving example however of Akbar’s appetite and taste for architecture is of course his capital city of Fatehpur Sikri – soon abandoned because of lack of a reliable water supply. This will require the entire next section for a detailed examination.